In the introduction to the book, " LIVING AS A CHRISTIAN" by A.W. Tozer, James Snyder gives us the following start to this study on 1st Peter. "What is a Christian? The contemporary scene is flooded with all kinds of erroneous ideas of what it means to be a Christian, most taken from the culture around us. For some, the Christian is simply a cleaned-up person trying to do the best he can. Some have crafted a template into which they try to squeeze the Christian. But the Christian does not fit, and the result is a caricature, without any power or authority. 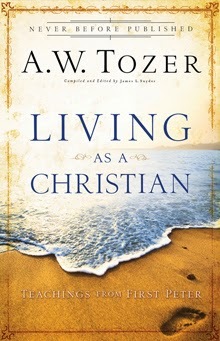 In this book, Dr. Tozer is writing to the Christian whose love and affection for Christ is the all-consuming passion of his life . . . every day. He is not writing about the carnal Christian who has not surrendered himself to Christ’s rule in his life. Throughout this book, he makes one assumption: that he is talking to someone who has experienced a genuine conversion experience. He insists that we must have the utmost confidence in our conversion experience and trust the Holy Spirit to guide us day by day in the way that brings the most glory to the Christ who died for us. Tozer begins where most writers end. To him, conversion is not the end but rather the beginning of a wonderful walk of faith and trust and, yes, of works. It was interesting to me to see Dr. Tozer’s comment about Hebrews 11. Most of us look at that as the “faith chapter” of the Bible, but Tozer, in his inimitable way, calls it the “works chapter.” Faith without works is dead, and there has to be a balance between what we believe and what we live. Nobody can walk far on only one foot—we need the balance of both feet, and Dr. Tozer gives us quite a spiritual balance as he describes from God’s Word what the Christian walk is all about. Certainly, we need to celebrate what we have been saved from. That should bring to us a great deal of praise and thanksgiving that God has saved us from a life of wretchedness. But, more important, we need to celebrate what we have been saved unto. The Christian walk is the forward walk. It is the “looking unto Jesus” that is most important. Every redeemed person has a specific destiny to fulfill. Discovering that destiny and fulfilling it in the power of the indwelling Holy Spirit is the joy of the Christian’s daily walk. We must start with Christ, continue with Christ and, finally, end with Christ. It is always Jesus Christ, our all in all; anything outside of Christ is not part of the Christian’s life and walk. 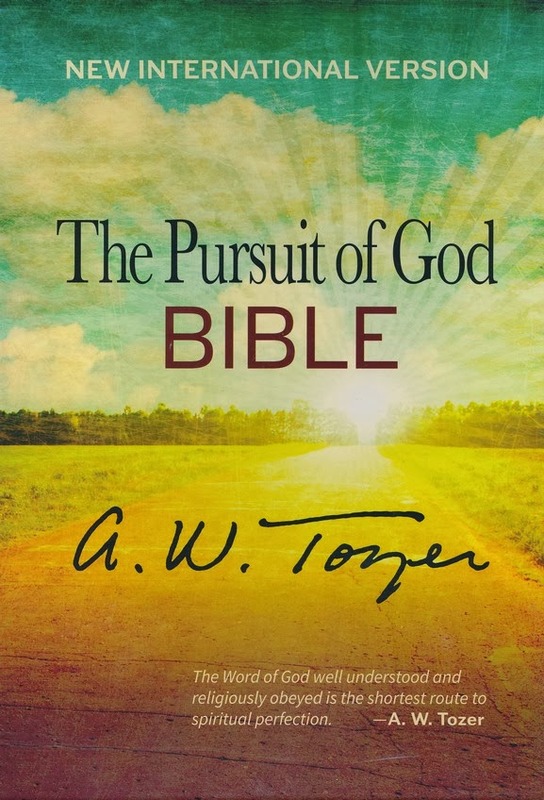 Throughout the book, Dr. Tozer spends time developing the theme of salvation as God’s master plan for man. The preciousness of God’s plan of salvation reveals the value He places on man. Salvation is not a casual thing to God, and should not be thought of carelessly by us. To use a favorite Tozer illustration, it is not put a nickel in the slot, pull the lever, take a box of salvation and then go your separate way. Rather, what salvation does to the person who embraces Jesus Christ is nothing short of revolutionary, and his walk from that moment on is nothing short of miraculous. This amazing Christian is the reflection of salvation’s glory in the world around him. Not only is salvation a precious and wonderful thing, but also so is the Christian. Salvation is not an end in itself, but rather a plan for man to get back into the center of God’s love and favor. Everything about the Christian reflects the glory of his salvation. All heaven looks with pride upon this curious creature called a Christian. This Christian can withstand anything that comes against him, including heresy of all kinds that have infested the Church from the beginning. Tozer describes these heresies and how the Christian rises above them, including the blatant attack of Christianity’s archenemy the devil. 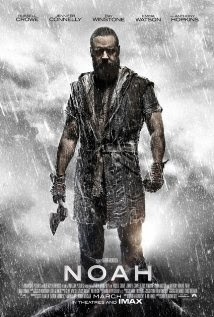 It also includes the Christian’s attitude toward persecution and suffering for the cause of Christ. This remarkable Christian is in the world, but he is not of it. Therefore, how he lives in front of the unsaved is crucial. Because of the Christian’s position in Christ, seated in the heavenlies, no matter what befalls, he is above all harm and can rest in the security of Jesus Christ, the victor. Dr. Tozer says, “No one, no thing, no circumstance can harm a good man.” This “good man” is immortal, and when his destiny on earth has been completed, his destiny continues in what he has inherited through salvation." 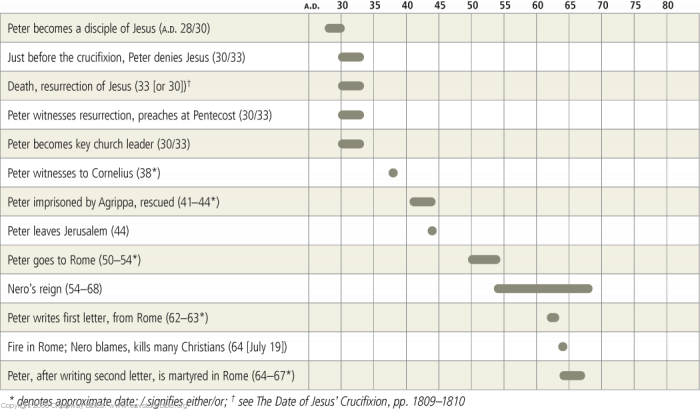 The Chart below is from the ESV Study Bible. 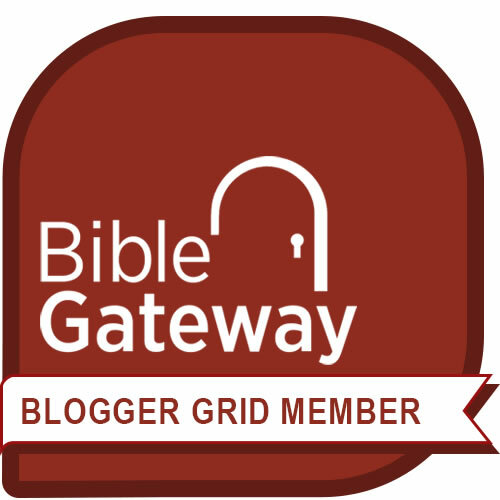 Other Informative Resources concerning Peter. 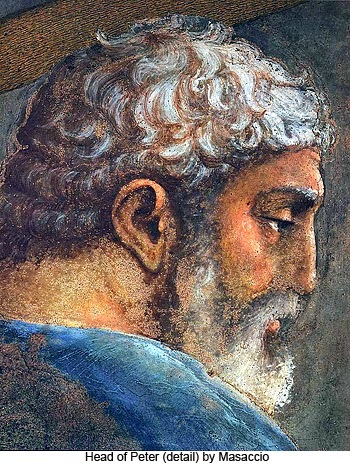 Reading the Letter/Epistle of 1st Peter today. 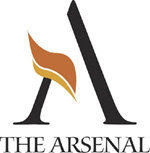 Seeking to discover what is God communicating to His people both originally and today through this letter?